Who would not like to have those straight teeth that can improve ones smile? Anyone would want to have healthier teeth, right? Thanks to orthodontic treatments getting rid of malocclusions are now possible! But conventional treatments are not favorable to everyone, metal brackets and metals are being avoided since it is unsightly and uncomfortable. Invisalign provides a more comfortable, convenient, and discreet treatment in straightening the teeth which makes it a popular option among teens and adults. It is made of clear and durable thermoplastic materials that apply a much-controlled force in moving the teeth to its proper position. Rock Point Family Dentistry only want to provide the best possible solutions for any dental needs. For teeth straightening, Invisalign is the best option in correcting teeth imperfections with the patient’s comfort and the effectivity of treatment in mind. Visit a dental office that is an Invisalign provider for a consultation to know the qualifications for the treatment. 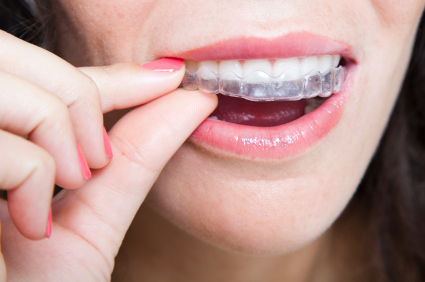 Invisalign may be effective in most teeth imperfections, but the dentist should check for the best course of action to follow for better results. If the dentist has evaluated, impressions of the patient’s teeth are taken for them to formulate a treatment plan specified for a single patient. A 3D image of the teeth will be shown and explained to the patient; it will show the movement of the teeth throughout the treatment duration. If the patient agrees then the impression and treatment plan is sent to an off-site laboratory that would custom-create the Invisalign trays. Once the Invisalign trays are ready, it will be provided to the patient with specific instructions to be followed. Additional dental appointments should be scheduled every four to six weeks for the dentist to track the progress of the teeth’s movement and provide additional trays if necessary. Wear Invisalign every day for at least 20 to 22 hours only removing it during cleaning, eating, drinking beverages other than water. Replace the trays as directed by the dentist, typically each tray is replaced every two weeks, but it also depends on the conditions of the patient’s teeth. Make sure to practice proper dental hygiene, fortunately, due to the removability of Invisalign it is much easier to clean all portions of the mouth. Keeping the teeth healthy can guarantee favorable treatment and result in teeth straightening. Clean the aligners using a soft-bristled toothbrush and gentle soap to keep the tray sanitized. When rinsing the trays, use lukewarm water instead of hot to prevent the deformation of the tray. Avoid using toothpaste due to its abrasive properties that can harm and scratch the tray. Straighter teeth do not only beautify one’s smile, but it also ensures the health of the teeth by correcting malocclusions that makes some areas in the mouth hard to reach. The mouth can be properly cleaned by correcting dental concerns for a better overall dental health and wellness. Give your smile a boost! Book an appointment with Rock Point Family Dentistry and check our Invisalign service in Cedar Park, TX. We are located at 115 S Lakeline Blvd #200, Cedar Park, TX 78613.